Welcome�baby home w/ this bassinet! Welcome Baby Bassinet. This beautiful bassinet is just overflowing with an array of baby items recipient will just love. This gift comes in pink or blue. Show just how much you care with spectacular care package! 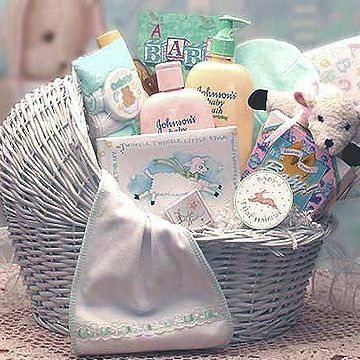 This gift includes the following: White Wicker baby bassinet, Flannel Baby Blanket, Baby Lamb picture frame, Lamb Beannie baby plush, Baby Lamb My first bank, New Baby Fortune cookies, 3 Pc Washcloth Set, Johnson & Johnson Baby Bath 12 oz., A Baby Is book (Book of love thoughts for baby) Johnson & Johnson Baby Shampoo 12 oz., 100% Cotton Baby Beannie/ Cap, and Johnson & Johnson Baby Lotion 12 oz.